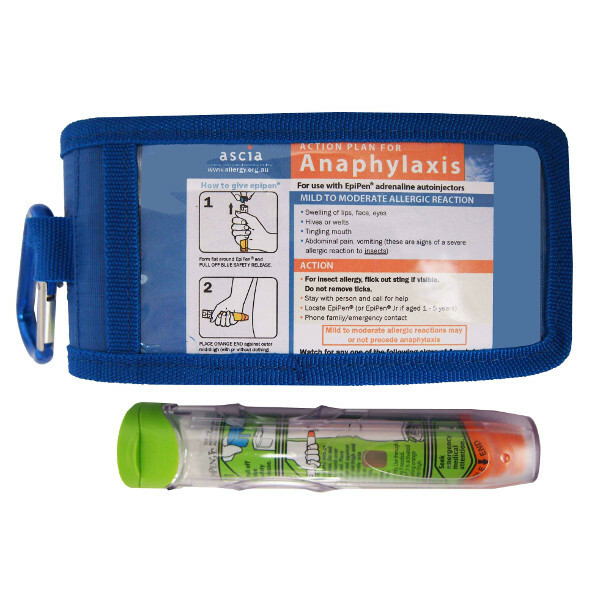 MedBag EpiPen holder – foil lined cases with carabiner clip. The pouches hold two Epipen®. Anapen®, or Jext® auto-injectors. Twin case – available in Orange, Blue and Black. 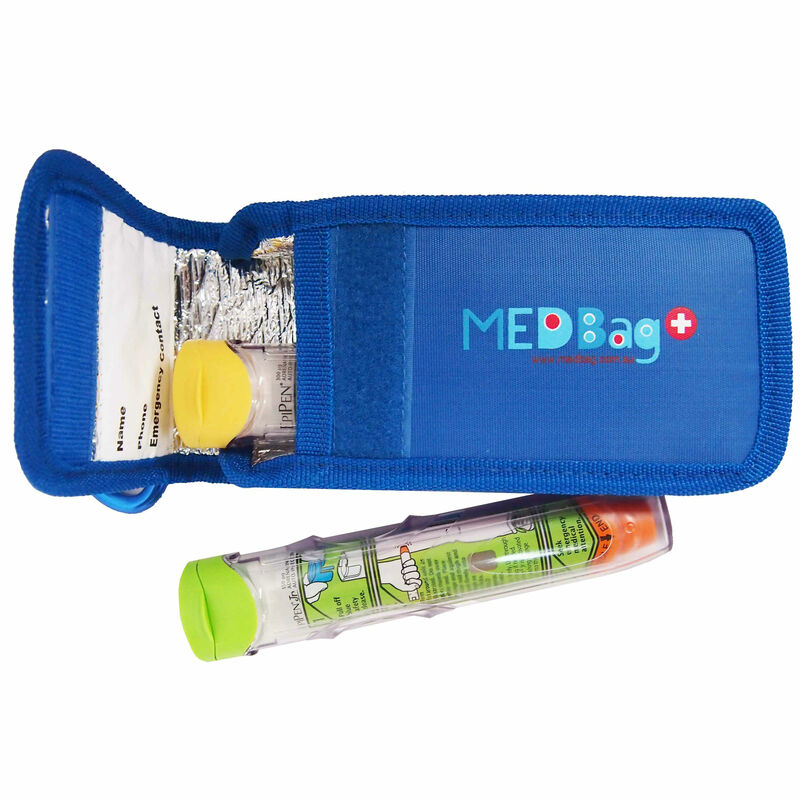 MedBag’s EpiPen holder is an attractive and easy to use foil lined case. The pouches are suitable for two Epipen®, Anapen®, or Jext® Adrenaline Pens. Internal Identification label for name & phone. Secure Velcro closer for easy access. Red Medical Cross to clearly identify it as a medical bag. 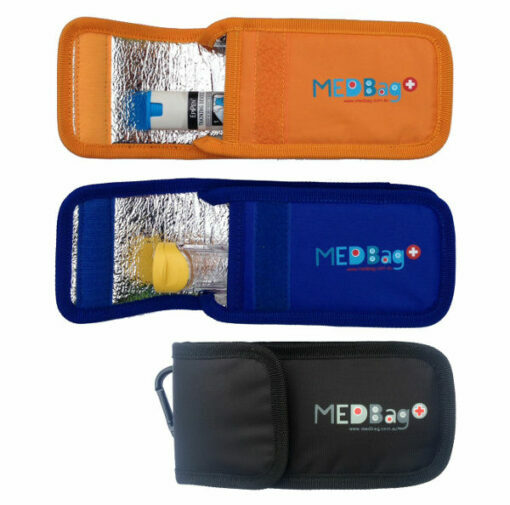 Medbag pouches are suitable for carrying two adrenaline auto-injectors such as EPIPEN®, Anapen®, and Jext® auto-injectors. The foil lining helps to regulate the temperature and the velcro fastening means that the pens are easily accessible. The front of the pouch features a red medical cross to clear mark it as containing medicines. The back of the pouch has a large clear pocket into which you can put instructions on how to use the pens or emergency contact and other relevant information. The clip on the back of the case means you can clip the pouch to your bag, stroller, or belt. The Medbag comes in bright orange to be immediately visible in case of emergency and also in blue and black for a more low key look. The Emerade® pen will fit in the MedBag Twin case but it does not hold the hard case supplied with the pen. Great size! Holds 2 epi-pens and a 1 dose container for antihistamine. I like the clear plastic pocket on the back. My 11 year-son likes the look and ease of access to his medication, if need be. The only downfall I see is the elastic loop w/hook. It’s not made very well and I forsee me replacing the loop very soon. Overall, I’m happy with the holder. Very happy with this purchase, previously pens in original boxes were getting tattered and damaged from moving around. In the pouch they are well protected. Just to add, it is important to document the expiry date and keep with the pouch as this is not on the pens themselves but is on the original packaging. 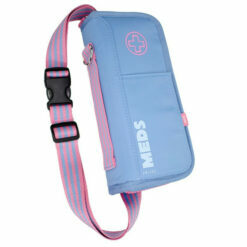 I got this to carry my Anapen in my bag as it doesn’t have its own hard cover like my epipen. Although the double cover carries 3 pens it is rather bulky. It will be handy for traveling. I may try the single one and see if that suits better. I bought this case for my sons after school. It’s brilliant. It’s sturdy. Love the orange colour, it’s well visible. Great product. Looks good and holds 2 epi-pens securely. The case is well made and really hard wearing. The plastic pocket on the back is perfect for my son’s Uni ID. Easily the best case he has had. Excellent case, but for the Emerade issue asterisked* under Dimensions above. This does not fit emerade pens unless you take the protective covers off against the manufacturers instructions! Absolutely fantastic! 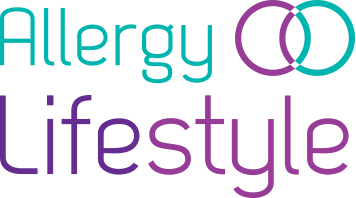 Just what people with allergies need, and we are able to make a list on the back to alert medics of the list of allergies we have. Great product.Daughter now happy to take her epipens out with her. It’s doesn’t fit the emerade pens !!! This should be written in the description . Very disappointed . Delighted with this case I had been looking for holder for quite a while holds 2 pens. Handy for holidays. A lovely, well made, insulated case. However, I recommend you clip it to a front belt hook. If you clip it to a rear belt hook don’t forget to take it off before you sit down or you will tear it! It is a little bit too big because we use it in our purse. I would have preferred the sea blue but it was not available…..